Rep. John Ratcliffe (R-TX) previewed the lines of questioning that Congress will ask former U.S. Deputy Attorney General Bruce Ohr about DOJ involvement in the Trump “pee dossier” in an interview Monday evening. Ratcliffe appeared on Fox News Channel’s The Story with Martha MacCallum, noting that Bruce and Nellie Ohr’s ties to Trump dossier author Christopher Steele were absent from the four Foreign Intelligence Surveillance Act (FISA) applications he analyzed. MACCALLUM: You are about to hear from someone who is of great interest in all of this. What role did Bruce Ohr, who was the deputy to Sally Yates, who was the acting Attorney General, who seemed based on the texts and emails we all now have seen to have a very deep interest — even though he wasn’t working on the Russia investigation — in keeping the dossier alive. Keeping it going and keeping Christopher Steele involved in all of it. And his wife, Nellie Ohr, worked for Fusion GPS. 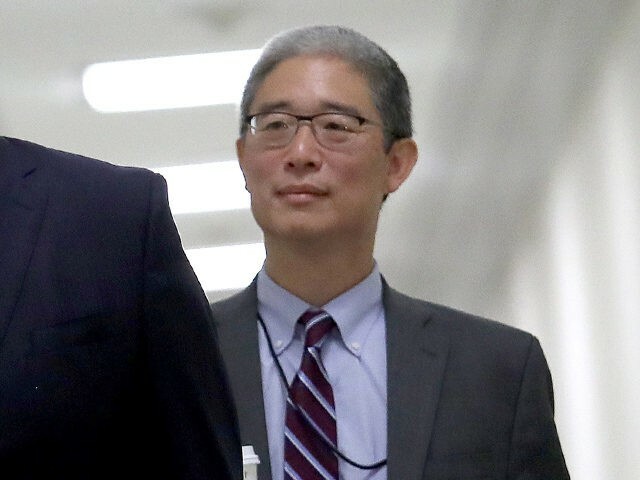 So, what do you want to know from Bruce Ohr when you question him from behind closed doors tomorrow? RATCLIFFE: Pretty simple, Martha. The Deputy Attorney General of the United States, Rod Rosenstein, told members of Congress under oath that he had no knowledge that Bruce Ohr was involved in the Russia investigation. And he told members of Congress that he wasn’t aware that Bruce Ohr had permission to be working on the Russia investigation. But we know very clearly — and it’s not in dispute — that Bruce Ohr had more than 60 contacts with Christopher Steele and his wife was retained and paid to create the dossier with Christopher Steele. Those are the definitions of materials facts and why it comes into play, Martha is, was this just Bruce Ohr and his wife or who at the Department of Justice and who at the FBI was aware of this information? When did they become aware of it? Because it goes to those four separate FISA applications and the information that was sworn to before those judges. MACCALLUM: And I would imagine you’re going to have a lot of questions about Sally Yates and whether or not she directed him to any of this. Let’s put up a couple of the tweets that are of concern about Bruce Ohr. The first one is from May of 2017. He says to Christopher Steele, “very concerned about Comey’s firing — afraid they will be exposed.” That is certainly something you would want to dig into more. RATCLIFFE: Very clearly. That’s just one of many texts that underscore the point that Bruce Ohr and his wife were working closely with Christopher Steele. It doesn’t explain why the Deputy Attorney General wouldn’t be aware of that involvement or if — whether Sally Yates as the prior Deputy Attorney General was aware of that. Again Martha, why it’s important. Remember those four FISA applications? You had folks like Sally Yates, and Jim Comey, and Andy McCabe, and Rod Rosenstein all swear to the court that they were giving full and complete information about the dossier. And I can tell you, having seen the unredacted FISA applications, that Bruce Ohr and his involvement and Nellie Ohr and her involvement was never disclosed in any of the four applications. Ohr testified to House lawmakers in a closed-door session Tuesday morning.